When strawberry season rolls around, you have to make a cake. The sour cream makes for a deliciously moist bundt cake studded with yummy fresh strawberries. I have been wracking my brain trying to decide what to make for Valentine's Day this year. I wanted something sweet and fun, but not too complicated. I have a heart bundt pan, so it seemed like the perfect way to infuse a little love into the situation. Of course a cake never hurt anything either. I was really tempted to do something chocolaty and rich and luscious. But we just did the Devil's Food Cake and I was feeling a little more in the mood for bright and fresh. I was scouring the grocery store for ideas when the pretty red strawberries caught my eye. After a winter of expensive and tasteless strawberries, it is nice when good fresh tasty berries start to hit the shelf again. The time is now! They aren't at their cheapest in my area yet, that won't come for a couple of months. But they are full of flavor and much more affordable than even a few weeks ago. 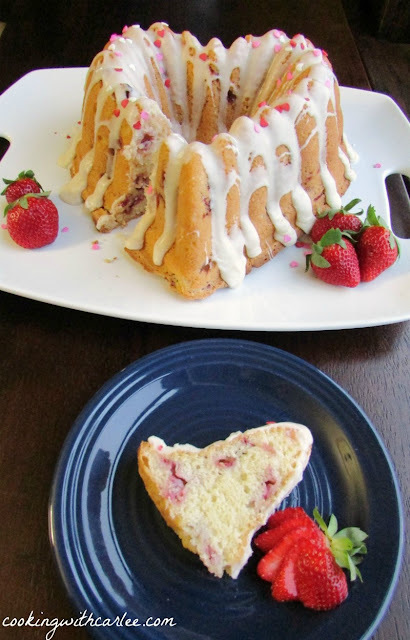 It turns out a simple sour cream bundt cake with chopped strawberries is a perfect balance of flavor. The cake had a delicate crumb and a nice look. It had a nice buttery flavor and the sweetness was cut by the sour cream and a bit of lemon juice. Everything about it exceeded my expectations. It would be a fun way to treat your loved ones on Valentines day, but it also strikes me as a perfect Easter cake or spring birthday cake. All it took was stirring together a few quick ingredients, folding in some chopped strawberries and baking it to golden perfection. You are just sure to love it! Beat in eggs, one at a time until completely incorporated. In a small bowl, stir together flour, baking soda and salt. Mix lemon juice and sour cream in butter mixture. Spread batter into the pan. Place in the oven and reduce heat to 325F. Bake for one hour, or until the cake tests done. Allow cake too cool in the pan for 10 minutes and then turn out onto a wire rack or your serving platter. Allow to cool completely. For the glaze, stir together sugar, vanilla and cream. Adjust consistency with a bit more cream or powdered sugar until you get a nice thick consistency, but thin enough to drizzle. Drizzle over cake. Well, guess what I have in the oven as we speak? Heart shaped strawberry cream cheese muffins!!!! Great minds girl!!! Your cake is GORGEOUS, festive and looks sooooo GOOD!!!!!! let's have a heart shaped foods party, I did mini heart shaped meatloaves last Sunday!! Let's do it, a heart shaped foods party would be fun! Everything is cuter when it's heart shaped. I love the meatloaf idea too and strawberry cream cheese muffins sound delicious. Now I'm hungry! Have a great weekend, Andrea! My waistline would disagree with you that cake doesn't hurt anything, lol. 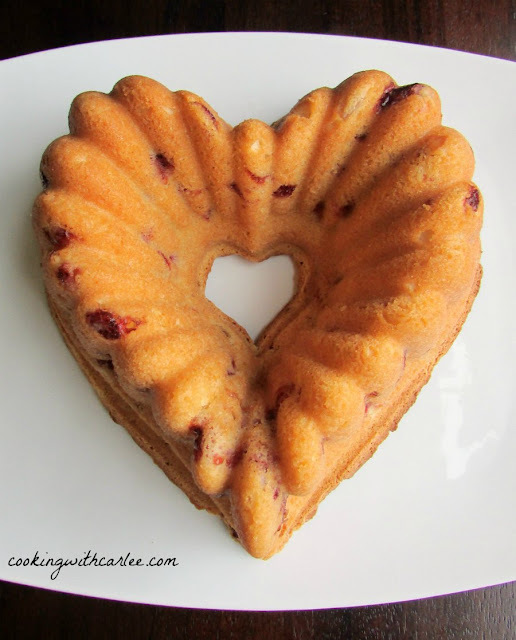 I love that bundt form, it yields such a beautiful heart shape. Have a great weekend, Carlee! Waistlines are such fickle things, aren't they? And they're always getting in the way of our fun. I think they should learn to tow the line a bit better. Oh well! Thanks, Jas! I love this Bundt pan. I think Valentine's is the most fun holiday! and it only lasts 1 day. This is beautiful. You know I'm going to have one of these cake pans. I wish we lived closer so that we could have a bundt pan exchange program!! I love this cake. 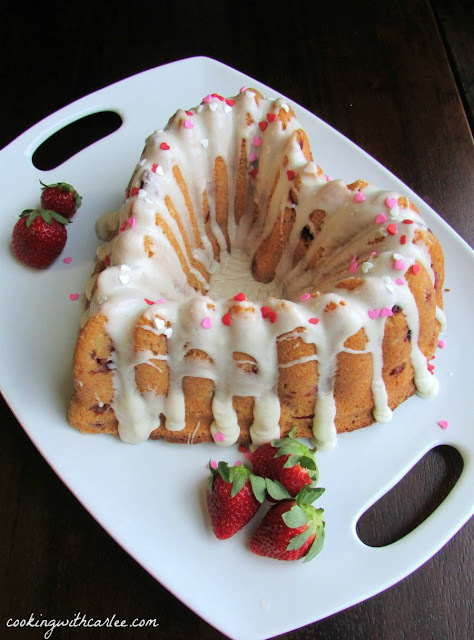 The heart shaped bundt pan is great. The glazing on the cake makes it beautiful. I do like strawberry and this is perfect for Valentine's Day. How cute! Perfect for the valentine in my life, and delicious too. Thanks! What a pretty bundt pan! Your cake sounds delicious and looks so pretty! I love bundt recipes with sour cream. The sour cream always makes the cake so wonderfully moist! Hi Carlee, this cake does sound a nice change to chocolate cake, although I can never get enough of nice chocolate cake! It will be a few weeks before we start to see nice strawberries in the shops, but will give this cake a go when I see some.... Do you think frozen strawberries would work? They may be a little too wet, don't you think? It is hard to go wrong with a chocolate cake, but this one is a nice delicate fresh change. It does seem like frozen strawberries might let off a bit too much liquid. If nothing else, I would be sure to defrost and drain them well first. Carlee, the cake is stunning! I will have to find some good strawberries, as I know my husband would love this cake! Thank you so much!! The good strawberries are finally making their way to the store so hopefully they keep heading north to you! 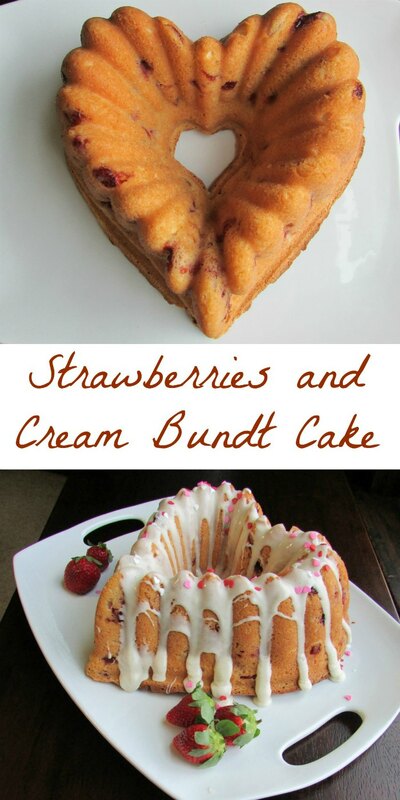 I have never seen a heart shaped bundt pan. This is beautiful and looks delicious. Thanks for sharing at Over the Moon. Isn't that a fun pan? Thank you so much! That is a beautiful cake and sounds really delicious! Thanks for sharing at the Family Joy Blog Link Party this week! This is such a pretty bundt! Thanks for linkin' up with What's Cookin' Wednesday! This is SO cute and sounds amazing! Thank you! It was a great way to enjoy some fresh berries! Me too! The sour cream really seems to give such a good texture. Thank you! I love your bundt pans, so many cool shapes and sizes, really love the look of this one! OMG! This looks incredible and I am pretty sure it taste it as well! Wow! This cake is so gorgeous and elegant. Love it! Pinned and sharing. Thank you for joining us at Family Joy Blog Link-Up Party last week. I hope you will join our next party starting Sunday at noon EST. Thank you so much and thank you for the party, I always enjoy it!